This book Is about those preachers whom John Wesley called his "Sons in the Gospel", their lives, importance in the Methodist movement and wider significance. It Is about those who entered In Wesley's lifetime; they had their work by 1791. Because of their unity and dedication they had more effect than either of the Wesley brothers in the creation of the worldwide Methodist Church. This study will analyze their lives and achievements. It provides new statistical information and brings to life the calling, travels and everyday experience of individual preachers. 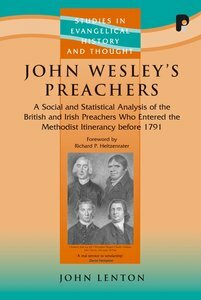 About "John Wesley's Preachers (Studies In Evangelical History & Thought Series)"
John Lenton, MA, MPhil, is the Convenor of the Methodist Church Archives and History committee and Honary Librarian of the Wesley Historical Society.